yoga is not standing on your head! Because I grew up doing yoga in India, I am often asked about the background, practiceand philosophy of yoga. People are eager to know where I do yoga and which studios or styles I recommend. Yet I receive the most curious looks when I explain that I do yoga "here"--in my home, in the morning, before breakfast, part of a routine as familiar to me as washing your face when you rise. Yoga forms an integral part of my day that in turn shapes the weeks, months, and years that comprise my time on earth. However, yoga as taught in India, does not involve merely asanas and pranayama--rather, yoga is a consciousness and way of life that ultimately creates healthy, peaceful individuals. As I like to say, yoga is not standing on your head--yoga is standing on your own two feet and having proper balance in life. If you ask most Indians whether they do yoga, they may appear mystified, for we approach yoga as a natural part of our daily routine and lifestyle. (This is probably why you won't find many Indians attending yoga classes). As a child I learned a comprehensive yoga practice involving not only the physical body, but also the mental, emotional and spiritual aspects. Every morning I rose to the sound of my mother chanting. After bathing, I joined my parents in meditation and recitation of Sanskrit mantras, and as the sun rose, we did Surya Namaskar and pranayama. My father would then impart a story from vedic teachings, and finally we would all enjoy a freshly prepared breakfast. Attending yoga classes offers a different approach to yoga which also has its merits. In fact more people may be doing yoga in Los Angeles than any other town worldwide a remarkable and noteworthy phenomenon! However, it is important not to confine yoga to class or make it just a physical act. For yoga meaning "union with the divine" encourages us to ask three questions daily: "Who am I? Why am I here? How best can I fulfill my purpose?" If a yogi is not introspective, then I do not believe that person can be called a yogi no matter how many headstands performed! 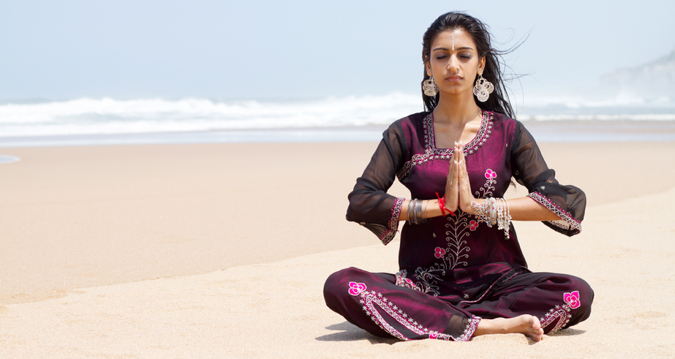 In India, asanas are regarded as preparation for inner seeking, because a supple, strong and fluid body creates an environment most conducive to reflection. A body that looks, feels and operates at its best is only a by-product of hatha yoga, and this physical prowess should not be regarded asa yoga's ultimate goal, with the yogi becoming enamoured by his/her physical condition. The true yogic journey begins when the body is strong, the mind centered and the spirit at peace. In addition to inner seeking, practicing yoga means leading a balanced, harmonious life, fueled by a strong inner awareness. Unfortunately people sometimes believe that what they have determines what they can do and be, lamenting, "If I only had a little more money, then I could do what I have always dreamed of, and finally I would be happy!" A yogi knows that happiness does not depend upon the outer world but upon a state of being. When I was leaving India my father asked if I was happy, to which I replied that I was. He replied, "Good". Then you will be happy wherever you go. If you are not happy here, then don't go, for you can never expect to be happy anywhere else." Yoga does not ask us to become celibate and retreat to a cave, nor does it require any celebrity endorsement! A time-tested science for thousands of years, yoga is a personal path accessible to all, requesting that the practitioner becomes the custodian of health and truth while living in the world. A householder who integrates yoga into daily life through pranayama, asanas, chanting, meditation, selfless service, and inner seeking is considered an adept yogi. In my father's words: "Peace comes not from the absence of conflict in your life but from your ability to cope with it." Yoga helps us know ourselves better and deal with challenges gracefully, inspiring others and helping spread joy.